Continuing our discussion (Part 1, Part 2) on CRM systems, this article will be more focused towards how Oracle CRM On Demand (CRMOD) can facilitate you with itinerary management. As it is said, “more the travelers can do online; more the company’s bottom line reaps benefits”. It is very important to have a solution that can empower your customers to handle travel transactions without picking up the phone. And surely you also might be having such reliable solutions. But what do you do to record these itineraries in your database for future reference? Do you do it manually on excel sheets? Or you are still dealing with good amount of paper work for this? With CRM On-Demand systems itinerary is managed in a well organized manner. Think of a scenario, where people visit your website and make a booking for a particular destination. Now with integrated CRMOD system, you need not to manually enter this data in some excel sheets for future reference. CRM On-Demand pulls the information directly from the website and makes the entire process absolutely effortless. The biggest advantage of this system is that if your customers are willing to book a customized itinerary, you can easily manage the information in CRMOD system and use it for future purposes, as well. 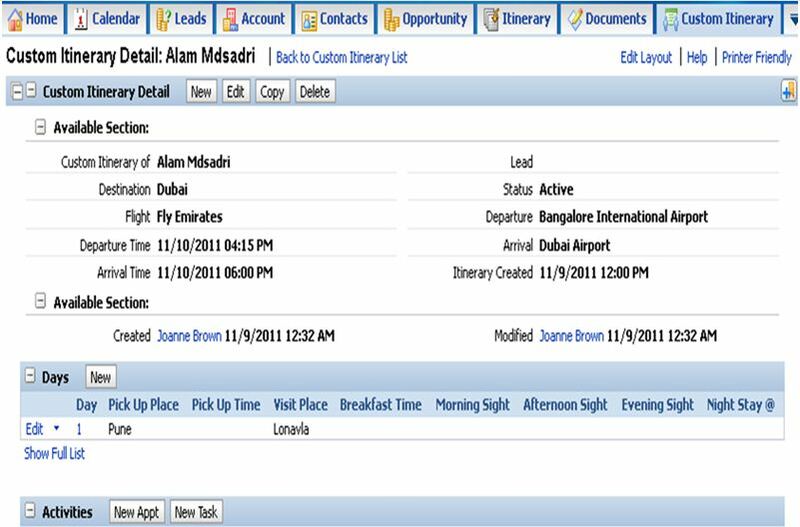 Now let us see the benefits of custom itinerary management with CRM On-Demand. First of all, with this kind of information being saved in your CRMOD systems will allow you to serve another customer with a similar itinerary and recommend him the best of your services, accordingly. You can propose him an accommodation that was preferred by the previous traveler and can also share his experience with the new customer. Moreover, a little bit of extra knowledge about the accommodation like the rooms, facilities, tariff, surroundings and other stuff will help you serve your customer even better. Apart from this, based on the travel data like destination, mode of travel and accommodation, you can also offer best packages available. When you have the records saved in your system, you can also offer packages on special occasions like anniversary, birthdays etc. The best part is when you have all the traveler information, you can also offer packages as per specific interests like for photography, sight seeing, sea viewing, and hiking to name a few. This entry was posted in B2B, B2C, Case Studies, CRM, CRMOD, How To, Oracle, Oracle CRM On Demand, Uncategorized. Bookmark the permalink.